Are you going on holiday to Venice in Italy? 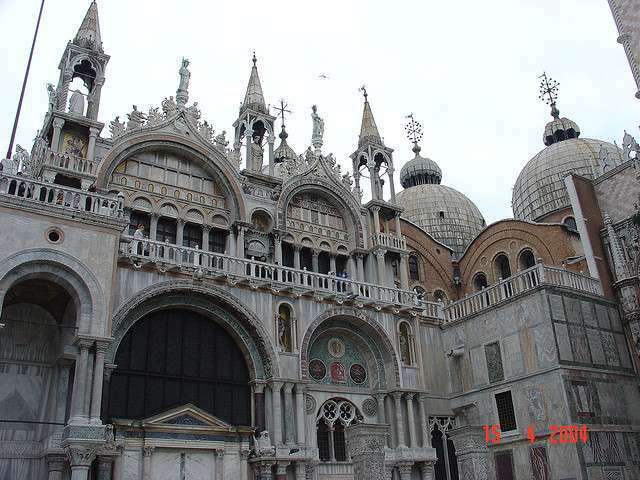 Would you like to visit the famous Basilica of St Mark the Evangelist? Our guide to St Mark’s Basilica in Venice gives you the facts & information you want to know. The Basilica of St Mark the Evangelist is probably one of the most spectacular works of architecture in the entire city of Venice. St Mark’s Basilica in Venice has been the official seat of the Patriarch of Venice for two hundred years, making it the most significant building of religious importance to the Catholic Church in this region of Italy. The Basilica is centrally located in the old town centre of Venice around St Mark’s square and opposite the palace of the Duke of Venice. The history of St Mark’s Basilica is a long and interesting one. St Mark actually lived and died in Egypt where he was initially buried, and had nothing to do with Venice during his lifetime. It was not until the 9th century that two wealthy merchants from Venice managed to have his body excavated from his burial place in Alexandria and have him moved to Venice. The reason for this move was more political than religious, as during the middle ages in Italy, the prestige of a city was directly related to the importance of any saints that were buried there. Venice was a great power commercially; however, the only St of any significance buried in Venice at that time was St Theodore who was deemed no match for the Basilica’s in other Italian cities. When the exhumed body of St Mark was brought to Venice, the ruler of the City immediately commissioned a grand new basilica to be built in his honour. The main architectural influence of St Mark’s Basilica is Byzantine, although there are clear traces Romanesque and Renaissance architecture in the building due to the fact that the basilica has been added to and adorned over the centuries by different rulers of Venice. The actual structure of the building is shaped in the form of a Greek cross which was a popular idea at that time and can also be seen in the Vatican today. In total, the Basilica of St Mark has five domes, with four smaller domes flanking the large central dome in the middle. The artwork on display inside the Basilica of St Mark is typical of the Byzantine era. Visitors to St Mark’s Basilica in Venice can expect to be dazzled by the colourful mosaics depicting scenes from the bible, as well as the magnificently decorated marble floors. Admission to St Mark’s Basilica is free of charge. Opening times are from 9.45am until 5.30pm except for Sundays when the Basilica is closed for public touring in the morning. Like all other major tourist sites in Italy that are of specific religious significance, visitors are expected to dress modestly. This means shoulders should be covered and both men and women should wear something that does not expose their knees or thighs.